Attention all Grade 12 learners: Don’t miss the chance to Shape Your Future! 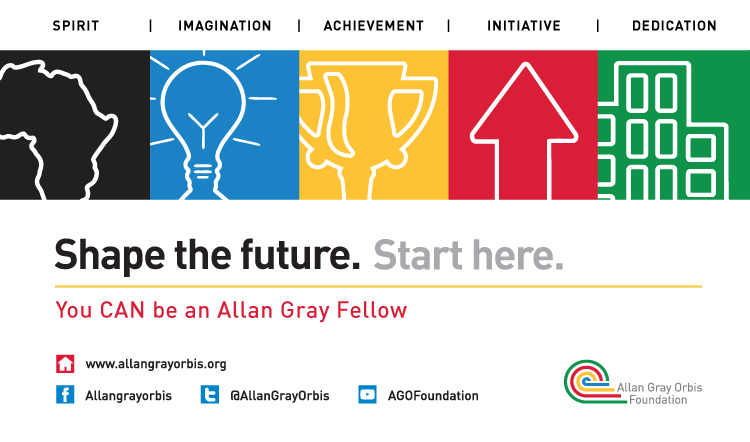 March 2014: The deadline to apply for the Allan Gray Orbis Foundation Fellowship is looming and closes on the 30th of April 2015 for Grade 12 learners. By applying for the Fellowship, the Allan Gray Orbis Foundation offers applicants that show potential in entrepreneurial talent an opportunity to develop as responsible entrepreneurs. Applicants who pass the initial screening phase of selection are required to write the National Benchmark Test. All applicants who meet the Foundation’s requirements in the application phase will be invited for an interview and if successful thereafter invited to attend a Selection Camp. Candidate Allan Gray Fellows are announced after the Selection Camps. The Fellowship distinguishes itself from other bursary and scholarship programmes with its holistic and individual investment approach. The Fellowship also offers the opportunity to engage in a personal and entrepreneurial development programme alongside access to university education. Visit www.allangrayorbis.org for more information and application forms.